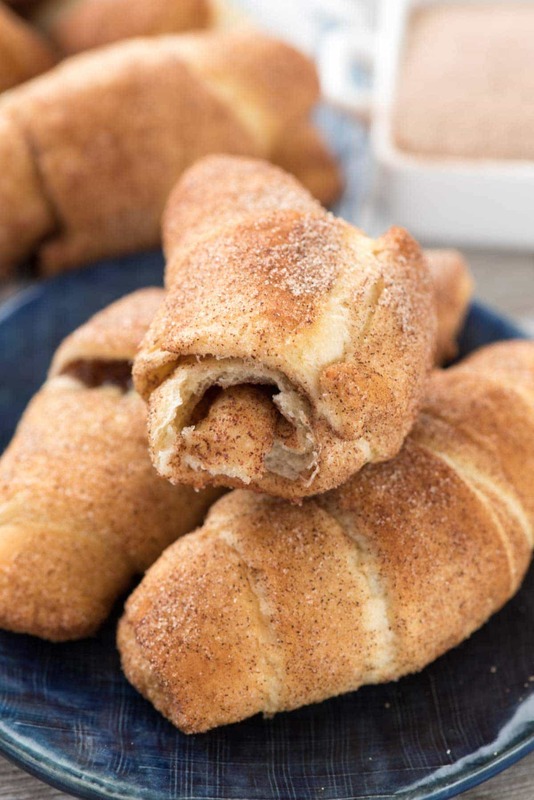 Crescent Roll Churros – this EASY baked churro recipe is crunchy and sweet and full of cinnamon flavor. 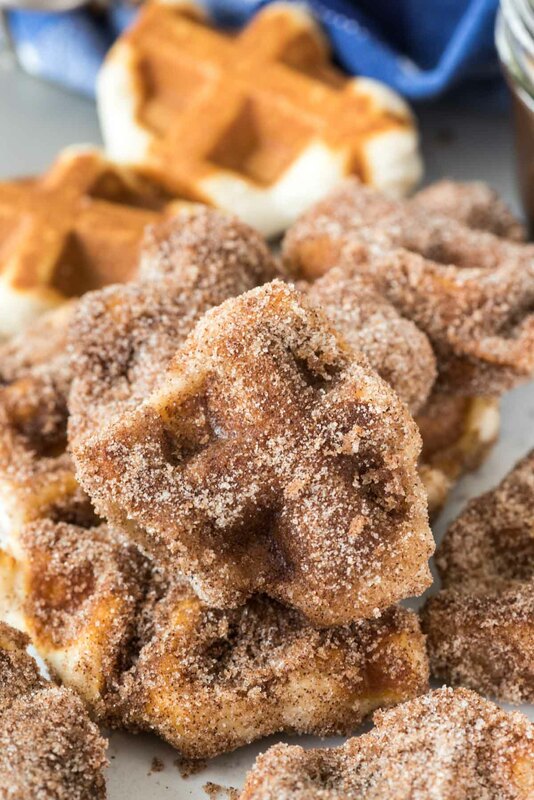 Only 3 ingredients and are the perfect breakfast, brunch, or dessert recipe! If you’re not familiar with the series, it’s about a teenage girl who has committed suicide and she sends tapes (her suicide note) to the people who were the cause of her depression and eventual death. It’s a heavy novel, especially so because it’s a young adult book. I have to say, it was hard to read at times because I saw a lot of my teenage self in Hannah (the girl). My depression and suicidal thoughts back then stemmed from anxiety, not from bullying as she experienced, but I still found threads of myself in her words. I think that, if you have teenagers or will have them soon, reading 13 Reasons Why should be required reading, especially if you or your spouse never suffered from depression. Everything that happened to Hannah is not fiction, even though the story is. Those things are happening in our schools, and even if the kids aren’t dealing with her issues, I would guess a fair amount deal with the same thoughts she had. Not only is her story a lesson to parents about what their teenagers might be thinking or feeling, but I think it’s also an important story for teens themselves to read or watch, with parental supervision. A lot of what the girl goes through is related to abuse, teasing that leads to bad reputations, harassment, and other things that are really uncomfortable to talk about, but they’re so important to talk about with your kids. If you don’t know where to start talking to your daughter about not taking crap from boys or your boys about not doing stupid (and/or immoral) stuff to girls, it’s a great jumping off point for discussion. Jordan is only 12, so I don’t think it would be appropriate for her at this stage of her maturity, but I will be watching/reading it with her in a year or two. Anyway, interesting segue to Crescent Roll CHURROS but, well, I’m really good at getting off the topic of food. ? So…Crescent Roll Churros. This is such a brainless recipe that I’m not even sure it’s a recipe. But I made them last week for breakfast on a whim and then had to make them again to share because they were so good. We inhaled them! 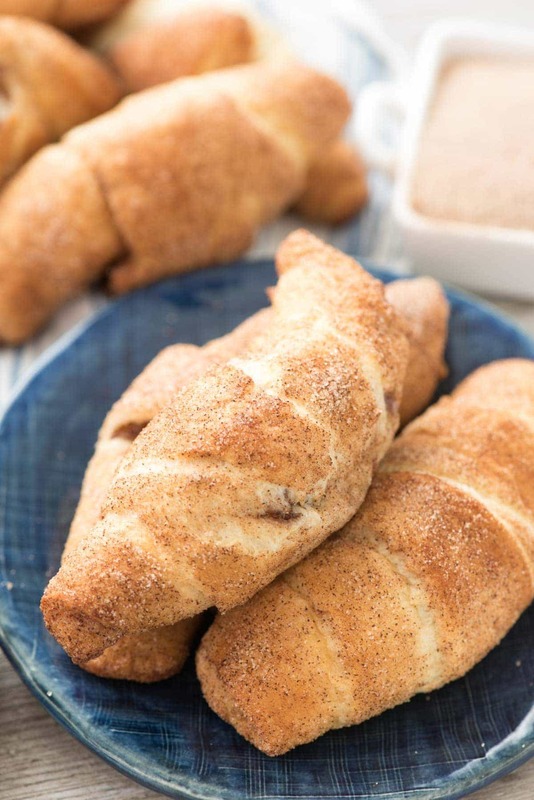 There are only three ingredients: Crescent Roll Dough (and you could use any prepared dough or puff pastry if you can’t find crescent rolls), sugar, and cinnamon. That’s it! No butter, no oil, no frying, just 3 easy ingredients and an even easier not-a-recipe recipe. I am guessing you’ve discovered I have an obsession with churros because this is my FIFTH churro recipe this year. 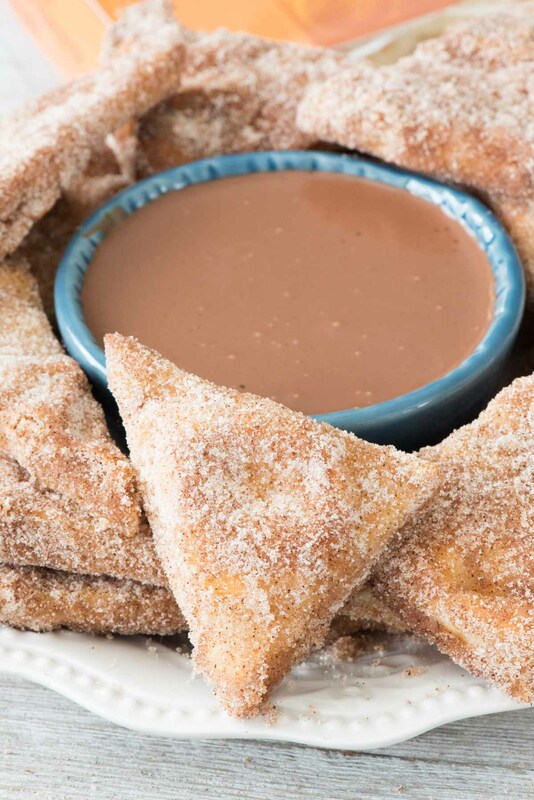 I’ve done churro pies, churro bites, churro chips, and churro dip, not to mention sopapilla hand pies which are pretty much churros stuffed with no bake cheesecake. Basically, I like dough with cinnamon sugar. If you like snickerdoodles, then you’ll like baked churros even more, I pinky swear! 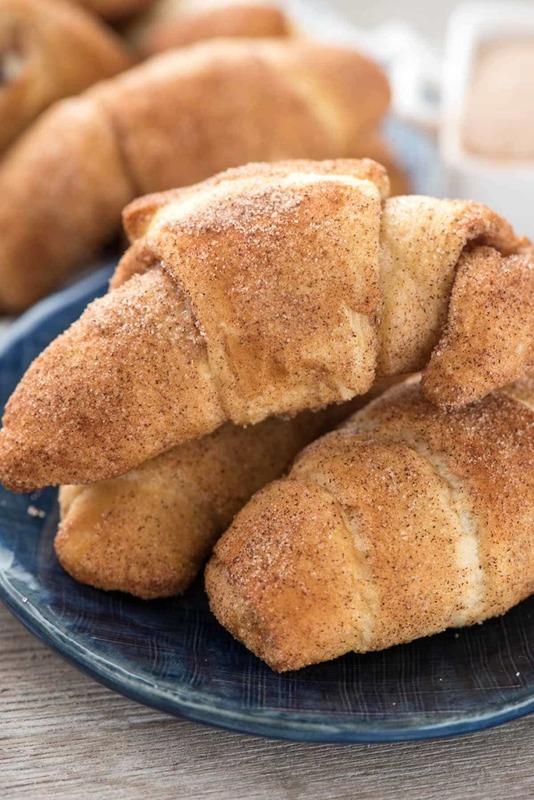 All you have to do to make this Crescent Roll Churros recipe is spread cinnamon sugar inside a crescent roll, roll it up, roll it in more cinnamon sugar, then bake it. Easy to make, even easier to chow down on 8 of them without even noticing. We ate these for brunch the first time and for dessert with ice cream the second. 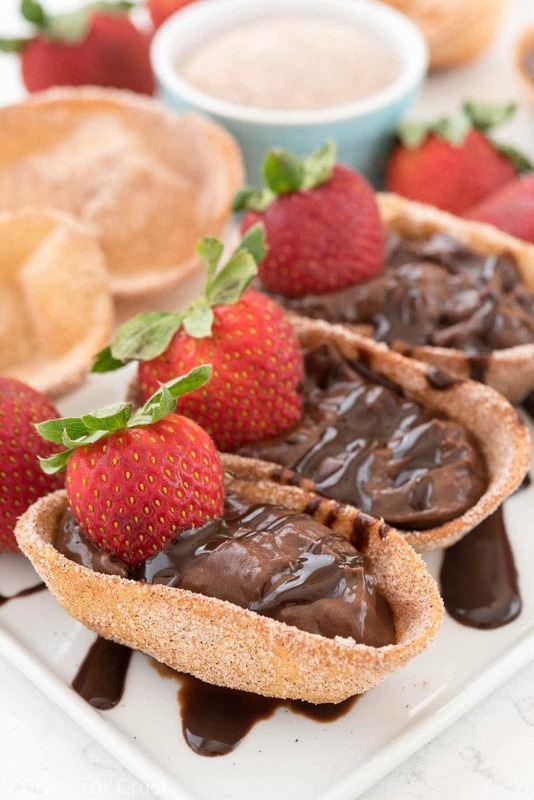 Don’t forget the dulce de leche or chocolate sauce on top of your Crescent Roll churros! Crescent Roll Churros - this EASY baked churro recipe is crunchy and sweet and full of cinnamon flavor. Only 3 ingredients and are the perfect breakfast, brunch, or dessert recipe! Unwrap and separate crescent rolls. Sprinkle cinnamon sugar on each triangle, then roll into a crescent and roll the crescent in the cinnamon sugar. Place on prepare baking sheet. Bake for about 12-15 minutes or until they're golden brown. Cool slightly before serving. Serve alone, or with ice cream or dipping sauce. If you love churros, be sure to try Churro Ice Cream Sandwiches, Banana Churros, or Churro Krispy Treats! I had no idea 13 Reasons Why existed – either in book format or the show. I need to read this book! I think your message is great about people talking to their kids about things and opening (or continuing) a meaningful dialogue. You’re the best. And churros. With crescent rolls. Nice! I have a crescent roll recipe Friday. The (blogger) baker’s best friend. I’m grateful that there are at least some mothers out there who are teaching their girls AND boys to have self respect and not be mean girls/boys. Il. Have to read that book and discuss it. Jordan is lucky to have you! And these churros look great. Always ready for something quick and easy. My 17 year old son watched the series in 2 days, and is reading the book now. He told my 19 year old son about it, and he also watched the series in 2 days. Think I’ll be making these churros this weekend! So we just or an email from our high school telling us not to let our kids watch 13 Reasons. Have you seen any of the TV series? The reason for this is because 13 Reasons Why’s show communicates to children that “suicide is the most viable way to make yourself heard”. The series presents it as the ultimate gotcha, the best way for the protagonist to communicate her point. These rolls!! Genius. I’m not going to lie, a little bit scared to watch 13 reasons. I’m glad this will all blow over (and be old news) by the time my kids might be interested! Open conversations are key.